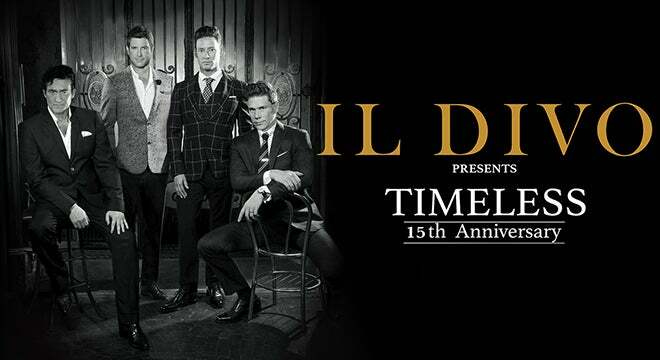 Following an incredible sold-out run across Europe, Asia, Africa, Australia and Mexico this summer and a current fall tour in the U.S. and Canada, Il Divo announced they will return to North America in 2019 for an all new leg of their Timeless Tour. Produced by Live Nation, the second leg of the tour will make stops in 19 new cities, kicking off March 4 in Regina, SK and visiting the Fox Theatre on Thursday, March 28. Discovered and mentored by Simon Cowell 15 years ago, Il Divo has evolved into the pre-eminent tenor powerhouse vocal group with four sold-out world tours to date, over 30 million albums sold, 160 gold and platinum albums in 33 countries to their credit and were the first Classical Crossover artists to have an album debut at #1 on Billboard’s Top 200 chart.